Before there was March Madness, there was the March Hare. Cohost of Alice’s tea party, this crazy critter has appeared in various ways through the decades, from Lewis Carroll’s rendition to the animated chap in Walt Disney’s 1951 “Alice in Wonderland,” and the CG version of “Tim Burton’s Alice in Wonderland.” No matter what form he’s taken throughout the years, he’s raised a few questions – like, just what IS a March hare, and why would it be so mad? We’ve got answers to your March Hare questions, plus some fun trivia about the March Hare in Disney history. · Why are March hares mad? · What’s the difference between a hare and a rabbit, anyway? They’re close relatives, but separate species. They’re easy enough to tell apart. A rabbit is small and carries a pocket watch, while a hare is larger and carries a teacup! · Who was Disney’s first March Hare? 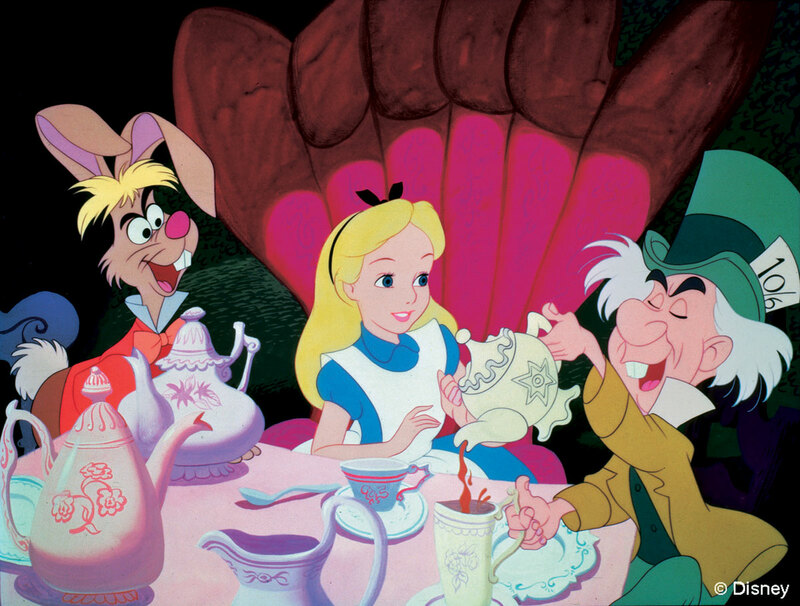 “Alice in Wonderland” was the first Disney film (but not the last!) in which voice actors also served as models for some of the characters. In fact, an entire black-and-white live-action version of the film was made to serve as reference for the animators. One glance at the wacky tea party participants, and you can recognize their inspirations. The March Hare was based on the popular singer, songwriter, and trombone player, Jerry Colonna. Colonna’s gift for improvisation helped him riff along with Ed Wynn (the voice of the Mad Hatter) and the result is comic chaos. Jerry’s voice can also be heard in two Disney shorts, “Casey at the Bat” (1946) and “The Brave Engineer” (1950). You can find his Star on the Hollywood Walk of Fame, awarded for his radio work. · What does a March Hare look like in the 21st Century? In the credits of “Tim Burton’s Alice in Wonderland” (2010), the March Hare is identified as Thackery Earwicket the March Hare, although he’s never mentioned by name in the film. This version of the March Hare was voiced by Paul Whitehouse. He not only participated in the tea party, but became the White Queen’s cook and finally fought in the Frabjous Day battle with his trusty ladle. He’s actually the least mad version of the Hare we’ve seen – anyone would be a bit on edge under the Red Queen’s rule. · Where is the March Hare now? He and the Mad Hatter made regular appearances on the animated TV series “Bonkers!” and “The House of Mouse.” And you can spot him today on the Alice in Wonderland attraction at Disneyland Park, in the concluding Tea Party scene. Now that you know him a little better, why not let your (March) Hare down? Throw a tea party, celebrate an Unbirthday, or believe six impossible things before breakfast. Let the madness begin!